My daughter, CC and her team are making a run at a AAU Division I National Championship. I am following the process through this series of blog posts. 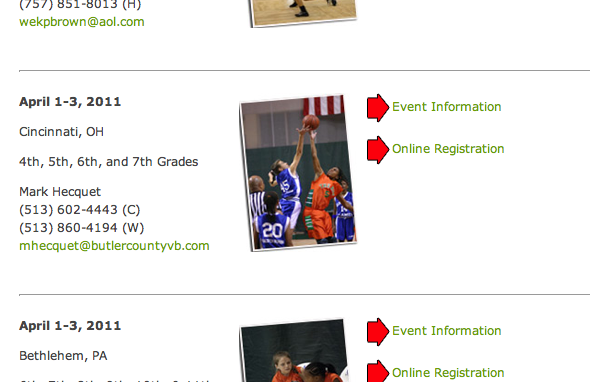 (Part 2) Youth Basketball: The Climb to an AAU National Championship - Tournament Qualifying Process. Step One: Find a Super Regional Tournament. The AAU website has a complete list of Super Regional Tournaments under the Events tab. Click here for the list. 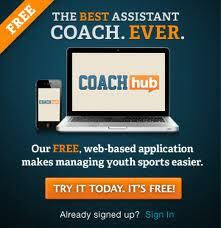 Step Two: Register for a Super Regional Tournament on-line. Step Three: Compete in Super Regional Tournament and win games. Teams are awarded invitations also called bids to the Division I, Division II, or Division III National Championships based on how well they finish in their Super Regional Tournament(s). The number of invitations awarded to the National Championship from a Super Regional is based on the number of teams entered in the tournament. The chart below outlines the number of bids awarded. All teams that receive an invitation to participate in a National Championship Tournament via a Super Regional Tournament need to play in their District Championship Tournaments to validate their bids. Step Five: Find a District Tournament to validate Super Regional Bid. 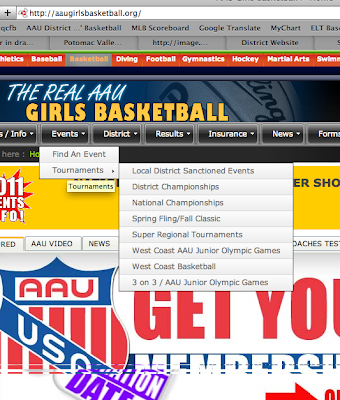 Go to the Events tab of the AAU website for a complete list of District Tournaments. Click here for the list. (Note: At the time of this post, this link led to a coming soon message. If this is not updated yet, go to the website of your district. For a complete list of District websites click here. From your District website, you can get a list of District Qualifying Tournaments. Step Six: Register for a District Tournament on-line. If a team qualifies for the tournament via the Super Regional but can not play in the Districts, their coach must petition the tournament committee to validate the bid. The bid may or may not be approved. Step Seven: Compete in District Tournament and place high. Note for Coaches: If you qualified your team via a Super Regional, you cannot add players for the District Tournament. If players are added your team will lose their Super Regional bid and the team will need to re-qualify via the District Tournament by placing in the top 2 teams of the division in which you want to compete. If your team plays in a Super Regional but does not received an invitation for the Division level Tournament that the team was targeting, then that team can compete in another Super Regional. A team that plays in the Division I District Tournament before a Super Regional and does not finish in the top 2 needs to play in a Super Regional to earn a bid. The team's finish in the District event that they played in will count for the National Championship seeding process. In effect, a team that plays in the District Tournament before the Super Regionals has pre-validated their invitation. The top four finishers in the previous year's National Championship Tournament receive an automatic invitation to the current year's tournament. The easiest way to qualify for a Division I invitation is to place high in a Super Regional Tournament. Tomorrow, my daughter is competing in a Super Regional. I am curious if you have seen much cheating on the girls side of AAU basketball? Cheating seems very common on the boys side, and it seems like Bobby Dodd and the AAU National office doesn't particularly care to enforce the rules against cheating. AAU disqualifed a team from the National Championship Tournament in Memphis last year, and even though Bobby Dodd made a promise to some of the boys that the coach who cheated would never coach again, that coach is still on the AAU circuit this season, and is even using the same team name: The Coker Phenoms. I was just curious if you have had any similar experiences on the girls side of AAU. Good luck with your quest for Nationals. There are two general sorts of AAU clubs taking into account philosophy.The main is an interest sort team,where all players are required to play.The second is a performance sort team,as a rule a "all-star" chose team,where the best players play and teams go to win games and events.So with your own particular child,get some answers concerning your local clubs, and pick the club that suits your own philosophy.Obviously,the children as a rule need to play on the same team with their best friends,so maybe that it the most essential thing.